The science behind how Southwest Greens of the Valley can get you the roll you desire on your putting green. 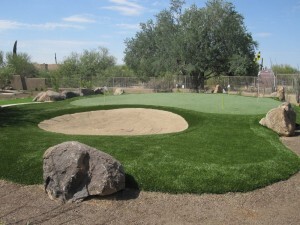 The cool weather of the Arizona winter makes it hard to get a good roll on your putting green, so at Southwest Greens of the Valley in the greater Phoenix area, we always like to put a stimpmeter on your putting green to get the speed of your green to your specifications that you work for you. the US Open. They stimp out around 12-13.
it to get it to a 9.5-10.5 stimp, or whatever speed you desire. Now you know the story behind green speeds and the knowledge behind every putting green that’s designed and installed by the professionals at Southwest Greens of the Valley, serving Phoenix, Scottsdale, Mesa, Tempe and the entire metro and suburban areas. Call us today at 480-664-9417 for your complimentary consultation and estimate. If you’re thinking about installing synthetic grass as your new lawn, your on your way to saving a lot of time and money! Here’s our analysis when comparing live grass to synthetic grass from Southwest Greens of the Valley in Phoenix, Arizona. headaches, and you’ll be saving tons of precious water, too! If you would like to view pictures, please visit our gallery.